In 1913, members of the Irish Republican Brotherhood (IRB) in Dublin began drilling in secret. While drilling continued, the IRB requested Bulmer Hobson to approach The O’Rahilly, a prominent nationalist, to ask him to approach Eoin MacNeill, Professor of Early and Medieval Irish History in University College Dublin. MacNeill had written an article, ‘The North Began’, in An Claidheamh Soluis, the Gaelic League’s newspaper, stating: ‘It is evident that the only solution now possible is for the Empire either to make terms with Ireland or to let Ireland go her own way’. It was the IRB’s intention to use MacNeill as a figurehead of a new nationalist army. O’Rahilly asked MacNeill whether he would preside at a committee meeting to discuss the formation of a volunteer body. Those who founded the Irish Volunteers first met as a group in Wynn’s Hotel, Abbey Street, on 11 November 1913. They agreed to hold a public recruiting meeting for a body to be called the Irish Volunteers, whose aim was ‘to secure and maintain the common rights and liberties of Irishmen’. On 25 November 1913, Eoin MacNeill called the first meeting to enrol Volunteers at the largest meeting room (the Rink) in the Rotunda Hospital. (The hospital was dependent on charity and for this reason the buildings and environs were created with an eye to fund-raising.) They would have preferred the meeting to be held at the Mansion House, but the then lord mayor, Lorcan Sherlock, refused to rent the premises to them. The doors were opened shortly after 8pm and Seán T. O’Kelly chaired the meeting. Eventually c. 4,000 people managed to squeeze into the Rink, while another 3,000 crammed the Concert Room and the adjacent gardens. Over 3,000 people signed up that night. Patrick Pearse was one of the principal speakers. Others were Seán MacDermott, James McMahon, Michael Judge and Councillor Richard Carroll. Batt O’Connor and Bulmer Hobson addressed the crowd outside. Though mainly a male audience, a special section set aside for women was full also. The IRB pressed workingmen to join the Volunteers, but the organisation had not backed the Irish Transport and General Workers’ Union (ITGWU) in the 1913 Lockout. Over 200 members of the ITGWU arrived, many carrying hurleys; later, another group, headed by a pipe band, tried to gain entry but, finding it impossible, marched down to Liberty Hall accompanied by a force of police. When A.J. Kettle, a well-known opponent of the union, spoke, fights broke out between ITGWU protestors and non-union attendees, but the disturbances were soon drowned out by the song God Save Ireland. This reflected the continuing disagreements between the ITGWU and those who became Volunteers, and James Connolly’s reluctance to join his Irish Citizen Army with the Volunteers. As a result of the steps taken by the IRB, many of its members came to prominence in the new organisation. 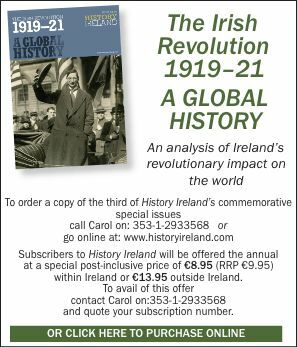 This meant that the IRB was able to steer the Irish Volunteers in their chosen direction; the Easter Rising was less than three years in the future. Joseph E.A. Connell is the author of Dublin in rebellion: a directory, 1913–1923 (Lilliput Press, 2006). B. Hobson, A short history of the Irish Volunteers, 1913–1916 (Dublin, 1918). F.X. Martin (ed. 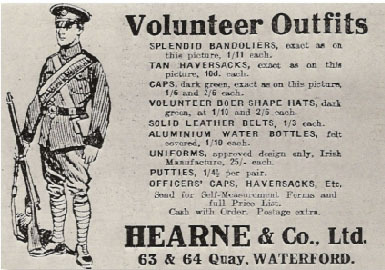 ), The Irish Volunteers, 1913–1915 (Dublin, 1963).